The beautiful surroundings together with the practices that will harmonize your body and mind, the deliciously prepared vegetarian meals and the joy of riding waves, all will help you to relax and rekindle your passion for life. Join this relaxing yoga retreat with Shamballah Retreats where you can enjoy the spectacular coastline of Sintra´s National Park that offers excellent conditions for the practice of surfing. The venue is a high quality house that can accommodate eight persons in three bedrooms, four in the master bedroom, and the rest in two twin rooms. There are three bathrooms available, one of them with a big Jacuzzi that will be used as part of the program. There is a mini gym and a living room with comfortable sofas to chill out, a pool table, and a large terrace to enjoy outside. 350 square meters of lawn invite you to connect to mother nature and delight with the sounds of birds and the ocean in the background. The walks around are nothing short of amazing with three very impressive beaches nearby. With an extensive beach along the cliffs, Praia da Aguda is wild and beautiful the access is for the adventurous ones but beauty and tranquility awaits at the end of the stairs. Along the coast, 2 km each way, you will find Magoito beach and Azenhas do Mar, a beautiful and awe-inspiring village perched on the cliffs. This location is ideal for long walks of exploration and close contact with Nature´s beauty. The venue is just a 10-minute drive from Praia Grande, one of the most consistent breaks in the Lisbon zone. This is a very versatile beachbreak with long, but often slow waves at low tide and faster, shorter shore breaks when the tide starts pushing up. With influences from around the world, Shamballah Retreats offers a wide variety of tasteful and healthy meals. They will prepare your meals with locally sourced and seasonal fruits and vegetables. All meals are mostly organic, plant-based (vegetarian) and easily adaptable to specific diets such as vegan, gluten, and dairy free. Please let them know in advance of your specific requirement regarding food. From the airport, take the metro towards Rossio. In this main station, you can get the train towards Sintra. Exit on Portela de Sintra station where you can get the bus to Fontanelas or Azenhas do Mar. Shamballah Retreats will pick you from there, just one minute drive from the venue. Let them know your arrival times so they can help you with the bus times. 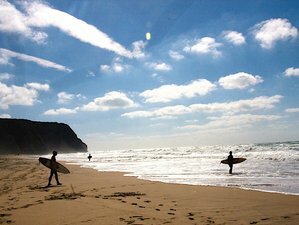 Shamballah Retreats bietet Yoga und Surf Urlaube am Meer im atemberaubenden Sintra-Cascais Nationalpark an. This vacation is available all year round (except on January 7 to 27) with arrival on Monday, please select an arrival date below.